Gone are those days when people used to carry those big, wired and costly speakers. The trend has changed now as the wireless technology has given new boost to the electronic devices, appliances and consumer electronics. Speakers are one of the most used devices in households and most of the people prefer to buy a cost effective, reliable, high quality, premium, and good output speakers. This has affected the global market and more companies are introducing premium quality speakers with wired and wireless combinations. 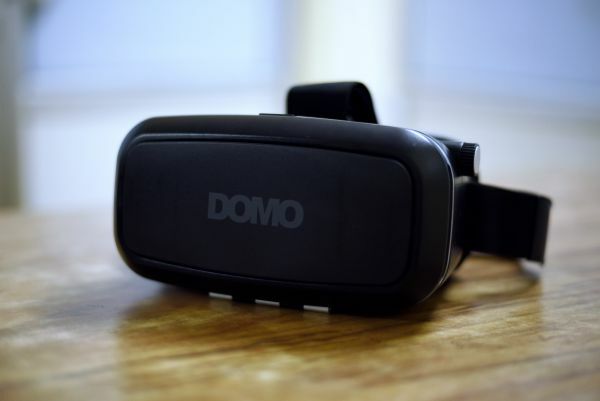 However, people are preferring wireless technology over wired as the speakers can be carried anywhere if they are portable and use technologies like Bluetooth. 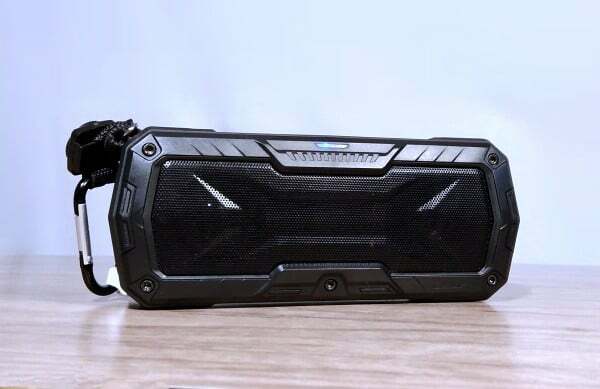 ZAAP Hydra Xtreme Bluetooth Speaker is one such newest and highly premium speaker available in the Indian market. But the big question is whether this speaker is good or not, whether it deserves the paid price or not. This article will look into its features and performance in details to check its strengths and weaknesses in the form of pros and cons. 1 What’s Inside the Box? First, of all it is important to look at components and accessories within the box. The box and packing of the speakers looks good and it should be expected for speakers. The box includes the Speaker itself, 3.5 mm AUX cable for connection, micro USB charger or charging cable, compass, carabiner, warranty card, user guide and thank you card. So it has all the basic components. 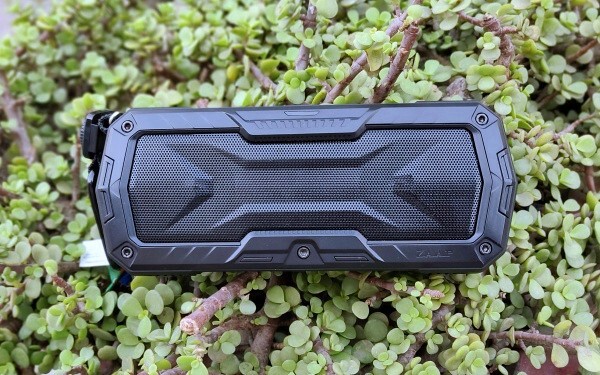 The price of the ZAAP Hydra Xtreme Bluetooth Speaker is Rs. 2999 on both Flipkart and Amazon and it comes with one year or twelve months of warranty. Before going into the details of the build quality and its details about the material used, we need to understand the usage. As this product is wireless and portable, we can carry it for picnic, outings and parties. So it has to be shock proof and water proof. By looking into its design and the material used it is both shock proof and water proof. The build quality is good with better design at front and back of the speaker. 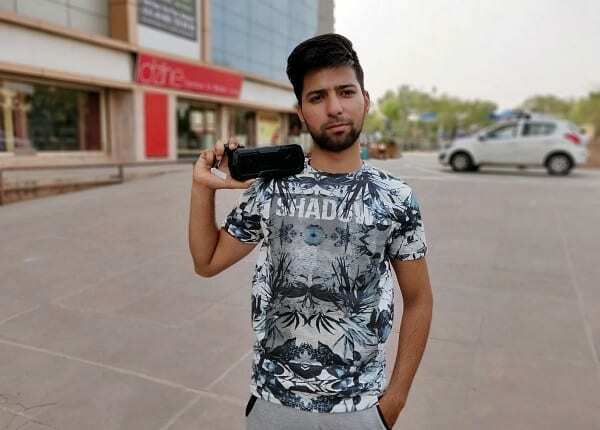 Design of the speaker is unique and it has won awards for its design. Even the air vents are placed properly and device looks premium. In hand, feel of the product is also satisfying as the Speaker is light weight, weighing around 450 grams. 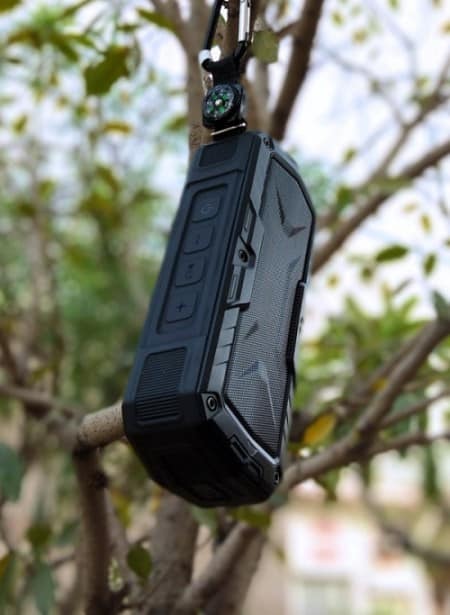 It is IP65 certified and comes with high degree of ruggedness that is good for outdoor use. The speaker comes with a 50 mm driver with the output of 12W or slightly higher than that. The device is a stereo with dual sub woofers and claims to emit the sound in omnidirectional pattern or in 360 degrees. The output does emit sound in all directions with high bass and this feels little off the radar as bass overshadows the vocals and musical instrument tuning. But it’s not bad rather it is above average. It also have good mids and highs for those who like to listen to more vocals. For such speakers Sensitivity should be maintained with proper impedance level. As the sound can reach upto 33 feet with Bluetooth, it is important to check its driver impedance. Impedance of the speaker is at 4 ohm with frequency range of 180 hz to, 2 khz. However, there is not much information on sensitivity. The speaker comes with Bluetooth version 3.0 and this is a weakness of the speaker. Higher Bluetooth versions offer better connectivity, range and output. But, it can be observed only in the extreme conditions. The sound in outdoor conditions is just above average and in indoor bass creates good impression. If you really like bass oriented products, this is surely a go for speaker for that price. The output might not impress you that much at lower frequency levels as the frequency response tend to create noise at this level and it’s impact can be felt. But at higher frequency and with high level of bass you might notice great output. Overall for the price, quality of the product and sound is exceptionally good. Battery is very important in wireless or Bluetooth speakers as the charging time and run time depends on its capacity. With 2100 mAh battery the typical charging time of the product is around 5 hours and the play time is approximately 8 hours at extreme sound output. If the sound output is kept at 40%-50% then it will last as long as 12 to 14 hours. As the company claims that the product can provide a battery backup upto 8 to 9 hours seems to be feasible and it can continue to perform well for longer duration of time. Even something goes wrong the warranty will cover the repair and service cost. This one is definitely good addition to the product as it helps in direct conversations. As it provides the noise cancelling feature, the quality should be better. The connection never drops and it offers continuous interface. However the microphone quality is not top notch but the call quality is decent. 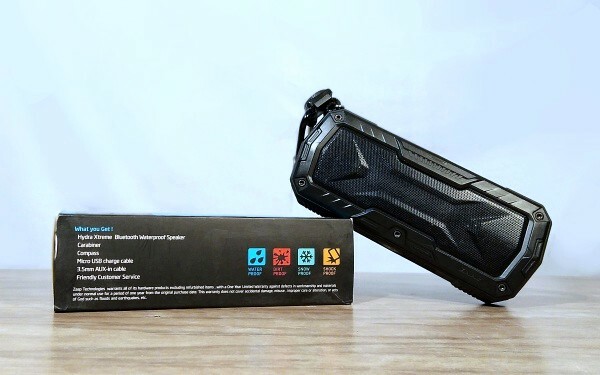 Analyzing the portable ZAAP Hydra Xtreme Premium Bluetooth Speaker was fun as we tested it under different conditions with different playback, different levels of output and battery testing. The device tends to hold good at many levels but when it comes to the price to quality ratio, it is up for argument and discussion. The speaker has better & unique design with good sound, great bass and long battery life. Overall it is surely a value for money speaker and you won’t regret buying it.